Add Excitement to your next golf outing with a putting contest. Everyone loves a putting contest and everyone, except pros can participate. It is very easy to conduct a putting contest, before or during your event. I like to host my putting contests before the outing starts. It gives golfers something to do and its a great way to to do some fundraising. Try and secure a sponsor for the putting contest, this will offset the costs. The sponsor will be highlighted on a beautiful full color sign so everyone knows who sponsored the putting contest. You will need a way to narrow your participants so they can putt for the grand prize. The grand prize putt is from 60 feet and must be videotaped. Your phone can do this great. You could seel raffle tickets and pull a name out of a hat or you could have the participants decide. I like to start with an easy putt from 3 feet, then maybe 7 feet then 12 feet. I narrow it down to how many putts you decide to buy. 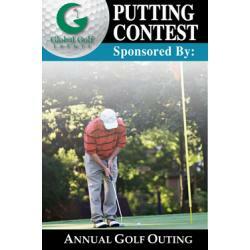 Complete the form below and add excitement to your next golf outing with a putting contest! Pricing is based on amateurs only. Non Touring Pro, Touring Pro, PGA Tour Pro, LPGA Tour Pro, Current or Former Professional Athletes are not eligible. Pricing is determined by the specified distance of the putt(s) and the prize value. All finalists putts must be videotaped. The videotape must include the measurement of the putting distance, ball placement, and the ball being struck and ending up in the bottom of the cup.